the special Dads we know. A great big Happy Father’s day to all those special men in our lives. Husbands, Grandfathers, Uncles, brothers, or even that special guy you call Uncle Joe, who really is not your Uncle but you grown to love him, look up to him and he treats ya like a Dad would. I especially miss my dear, loving Grandfather on a special day like Father’s day. Perhaps I just miss buying him old spice, or a pair of slippers. Those were always his simple wants, for every occasion. He was the one constant solid, always there for me, and truly the best Man ever. I can remember him packing a thermos full of milk , a pack of Oreo’s and taking me to the park to push me on the swings for hours. I can remember him chasing down the Mister softee truck, always before supper just so I could get my soft serve. Of course, he would get a little something, something too and always make my grandmother a little perturbed. I can remember my morning wake up calls just to be sure I was up and at em’ getting ready for work. I can remember cold, snowy days in Buffalo and me getting in a warm car all brushed off and ready to go. Even when I had my own apartment, he would drive over to do this for me. I can remember him standing by the window on my late nights home and then running to his bed, as though I never knew he was waiting up for me. I can remember him dressing me up when I was little in his big floppy hats, and singing one little, two little, three little Indians. I can remember him busting out in a song in the middle of a restaurant and me never feeling too embarrassed. I can remember the day he first laid eyes on Alex, our first born son and looking as though he had just become 30 years younger and so full of life again. I can remember Alex jumping on his bed, and the very same song he would sing to me as a child, he would sing to him. The I can remembers can be written in a book of 100 pages or more. He walked me down the aisle on our wedding day with tears in his eyes. Proud, and sad that he was letting his little Debbiedoo’s go to another man. I truly was a Grand daddy’s little girl. Mike and Gramps became very close in his later years. My husband took care of my Grandfather as though he was his own. They loved and respected one another, and had one major thing in common. but in the Man that I married. I dedicate this Father’s day Poem to them and all the fantastic Fathers in this world. We need them in our lives, our kids need them… the World needs them. Cherish the day and enjoy those special Men. Our boys are blessed to have the Dad, Father, and strong role model they do. The man I call Husband, now and forever. Very well put Debbie. Such a sweet heart felt story. You have a great hubby and I know he is a great dad to your boys. Hope he has a wonderful day on Sunday. Thanks for the sweet poem. 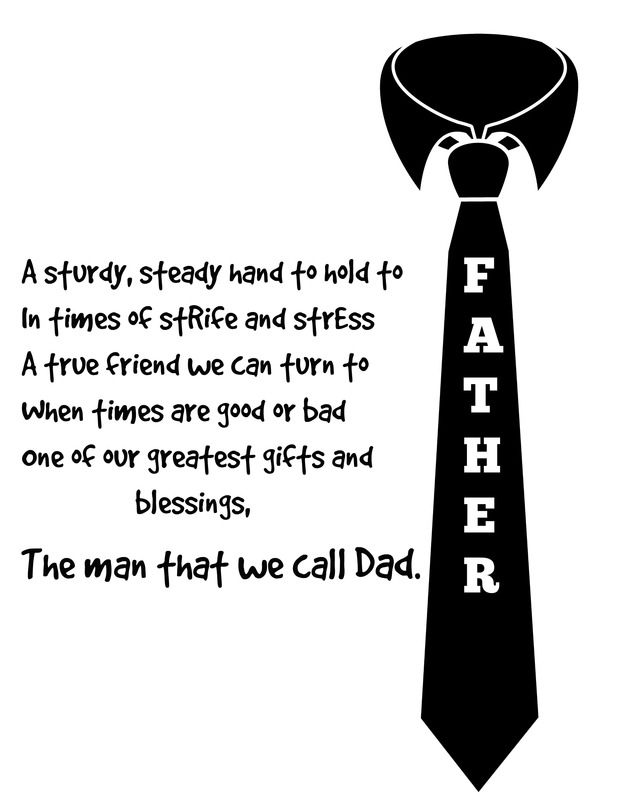 What a fabulous printable…and love your sentiments on your dad…Father’s Day can be bittersweet with some of us who have lost their fathers..I miss mine every day…I miss that phone call on my birthday…the one that came very early in the morning to ask, “am I the first one to wish you a happy birthday today” …. even though my hubby would be the one, I would always answer, ” yes of course”….Have a most wonderful weekend celebrating it with the dads in your life! My father is not a part of my life. My grandfather was my father figure. He called me his baby until the day he died. He never met my husband, but they are very similar and I know they would have been great buds. Thanks for sharing your memories and bringing back mine. I loved that you shared this piece of your heart. You are blessed.